After months of questioning by the News4 I-Team, two federal agencies have vowed to study injuries from vaccines alleged to have been given incorrectly. An I-Team review found half of all the new federal vaccine injury cases allege “shoulder injury resulting from vaccine administration,” or SIRVA, and have little or nothing to do with what was in the syringe. Both the Centers for Disease Control and the Health Resources and Services Administration previously told the I-Team there were no comprehensive studies of SIRVA underway, despite the relevant information being filed into thousands of court cases alleging that injury. The influx of new SIRVA cases has further hampered an already backlogged court system riddled with delays. Those cases allege the shots were administered incorrectly — usually too high on the arm — but the I-Team found the program has no mechanism to notify the shot-giver of the injury he or she likely caused. Thus, they would have no reason to seek additional training. Ann Wyborski didn't think twice when her OB-GYN suggested she get her flu shot in 2013. She was nine months pregnant at the time. "They swabbed the whole area," she told the News4 I-Team. "But as soon as [the needle] went in I said, 'That's too high.'" Wyborski says by the time she got to her car, she struggled to put on her seatbelt. She couldn't type on her keyboard at work or do anything around the house. "It was a throbbing constant pain — the most excruciating pain I've ever had," she said. About a week later she went into labor and gave birth to her baby boy. She had trouble nursing and even holding him. "I realized there was a massive problem because I had just had major surgery and I was crying about the pain in my arm, not from my C-section," she said. She went to her doctor and an orthopedic specialist, but they didn't know what was causing her pain. They even sent her to physical therapy, which Wyborski says worsened her condition. She was suffering from SIRVA. "The person administered the shot in the wrong spot, is basically what happens — usually too high on the arm," explained Renee Gentry, who runs the Vaccine Injury Law Clinic at George Washington University. Gentry says SIRVA has become so common; it's now covered under the National Vaccine Injury Compensation Program — a nearly $3.7 billion trust fund created and run by the federal government to take care of victims with catastrophic reactions to vaccines. "Vaccines have been an extraordinary contribution to society," said Gentry, "but they're not magic. They are pharmaceuticals, and anyone can react to them." To keep companies developing and producing vaccines, the government took on the liability back in the late 1980s, protecting vaccine-makers and those who give the shots from being sued. Instead, these cases go through a special vaccine court inside the U.S. Court of Federal Claims. In a traditional lawsuit, the victim would usually have to show negligence, not just that the vaccine caused the injury within a certain timeframe. More than 80 percent of all compensation awards in the vaccine court are negotiated settlements, which allows the government to include language stating it has not concluded, based on the review of the evidence, that the vaccine caused the injury. A $0.75 tax on every shot given funds the vaccine compensation. Since the program started, about 6,000 victims have received nearly $4 billion. "It has good intentions and it means well, it's just not being implemented correctly," said Martha Toomey, a parent of a vaccine-injured child. It took Toomey more than a decade to get compensated after her son, Jeffrey, started having seizures within 24 hours of getting a vaccine. She says he ended up with a traumatic brain injury and a lifetime of health problems. "There are a lot of words in the English language," said Toomey, "but I can't think of anything that would describe that kind of hell." Hers is the kind of family the Vaccine Court was designed to help, but the program now has five times the number of cases it had in 2011, and Congress has never increased the number of judges allowed to hear them. "Right now, the earliest available hearing date is in 2020," said Gentry. The U.S. Department of Health and Human Services declined the I-Team's request for an on-camera interview. But after a month of questioning, the agency finally acknowledged half of all the new cases filed in the court last year were not vaccine reactions — they were SIRVA cases. "It's frustrating, I think, for everyone involved in it, because it's preventable," said Gentry. And the I-Team discovered no one keeps data on how often SIRVA happens, where it's happening or even which shot-givers caused the injury. So they're never told to improve their technique, which Wyborski calls ridiculous. She says a temporary nurse from her doctor's office gave her the shot. "Once an injury happens, they need to follow up and make sure that person doesn't continually injure more people," Wyborski said. In a statement to the News4 I-Team, HHS admitted it "does not track or monitor this data" — despite the info being filed in to the record with every vaccine court case. "Somebody at HHS has to say, 'I'm going to take control of this and I'm going to fix it,'" said Toomey, who also serves on a vaccine advisory commission, which recommended Congress double the number of judges for the program in 2016. HHS has asked for increased funding for the program each year but told the I-Team "as to the allocation of the requested funding, this is a question for the Congress." "Yes, Congress should look at this," Maryland Sen. Chris Van Hollen told the I-Team. Van Hollen pointed out that the benefits of getting vaccines still far outweigh the risks, but he says SIRVA is definitely something federal agencies should be tracking. "We need to collect the data," said Sen. Van Hollen, "because you can't make informed decisions if you don't have the information to start with." A review by the News 4 I-Team found the Vaccine Injury Compensation Program has paid 575 SIRVA patients more than $76 million while doing little to fight the problem. "If you don't inform the people who are doing it wrong, they're not going to learn to do it right," said Van Hollen. The Health Resources and Services Administration is the HHS agency that oversees this program. A HRSA spokesperson told the I-Team a confidentiality provision in the program prohibits the agency from notifying the vaccine administrator of the corresponding SIRVA case. Because they are protected from liability, the shot-giver is not a party to the lawsuit, so each SIRVA victim would have to give written consent to allow them to be told about the vaccine injury they likely caused. The CDC says the increase in the number of SIRVA cases could be because more people are getting shots or because more people are aware of SIRVA and reporting it. Each state decides which medical professionals are allowed to administer vaccines and the training required; some have relaxed their rules over time to make vaccines readily accessible to the public. 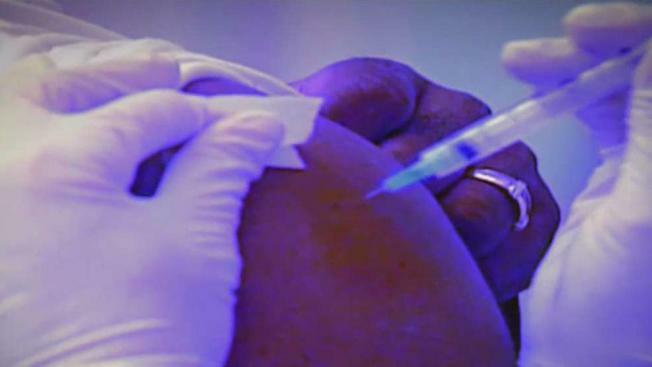 The CDC has launched an educational campaign on the correct way to administer shots. They're supposed to be given in the deltoid muscle, the thick part of the upper arm, but not too close to the shoulder. In January, a representative from the CDC's Immunization Safety Office told the I-Team it had no comprehensive data on SIRVA occurrences and no immediate plans to do any further investigation. He had conducted a partial study of voluntary reports submitted to a separate system called VAERS, the Vaccine Adverse Event Reporting System. The CDC found most of the SIRVA injuries reported happened after vaccines were administered at pharmacies or stores but cautioned that that system doesn't verify the injury or identify its cause. Just last week, the CDC told the I-Team it will now work together with HRSA to conduct an epidemiologic review of the SIRVA claims in the Vaccine Injury Compensation Program, which they're hoping to complete by the end of 2019. "I think it needs to be fixed," said Wyborski, who got a settlement from the program for her pain and suffering, medical costs, and lost wages. She says no amount of money is worth what she went through.